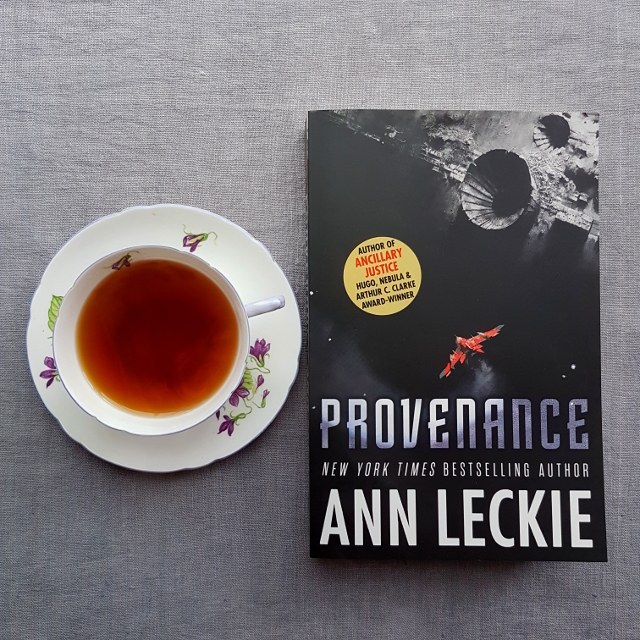 I really enjoyed Ann Leckie’s Imperial Radch trilogy, so I was delighted to get my hands on a copy of Provenance. Although set in the same universe, the focus is on different characters… and, indeed, a different civilisation altogether. The Hwae are a society that values vestiges–souvenirs that mark important occasions or are connected with significant historical figures. These can include everything from party invitations through to the scroll laying out the society’s declaration of independence. Ingray is on a quest to recover a set of stolen vestiges. Having been adopted into a family of political influence, Ingray was brought up to value ambition. Her mother has pit her against her brother in a competition to prove who is the most suitable heir. This quest is Ingray’s last desperate attempt to prove to her mother she is worthy. I really loved Ingray as a character. She might have been brought up to be ambitious, but she really only goes along with it because she is an orphan and will be on her own if her adopted family throws her out. And the truth is she’s not very good at it, lacking the ruthlessness needed for political manoeuvring. Ingray’s strengths are in her administrative skills and her compassion for other people. The times when she acts ruthlessly, she’s motivated by the desire to protect someone or something. Ingray is one of those people who work tirelessly behind the scenes, but prefers to avoid the limelight. So, it was delightful to see someone like that cast as the hero of the story. The plot was full of unexpected surprises and it took me a little while to get a feel for where it was headed. Every time I thought I had a handle on it, it would twist in a new direction. It went from rag-tag crew to heist, to murder mystery, to hostage drama. I rather enjoyed the variety, though, as with Ancillary Justice, the second half felt more settled than the first. Provenance does a wonderful job of building up the universe. We get to see a different civilisation with different concerns and customs. We even get to see a little bit of what this civilisation thinks of the Radchaai and the outcomes of the previous series. While the sense of a nuanced universe wasn’t lacking from Ancillary Justice, Provenance adds extra layers. It was particularly interesting to see some of the Geck, the second of the alien species known to exist in this universe. They received a passing mention in the previous series, but here we actually get to see the Geck ambassador at work. The author does a good job of making her alien species feel strange and somewhat threatening, while at the same time making them relatable. Leckie also continues to do interesting things in relation to gender. While the Radchaai use feminine pronouns for everyone, the Hwae differentiate between male and female–which may make the writing style more accessible to some readers. The Hwae also have a third gender. This is never made a big deal of, but is simply present and pervasive, showing the culture as it is without signposting. In this way, the author shows that she trusts her readers, rather than spoon-feeding them. All in all, I found Provenance a thoughtful, nuanced book that was a delight to read.